I recently had a few friends ask me to do a post showing different ways to wear ankle boots/booties! As I'm sure you've noticed, I'm a huge fan of these types of shoes and have at least 5 pairs (eek!). 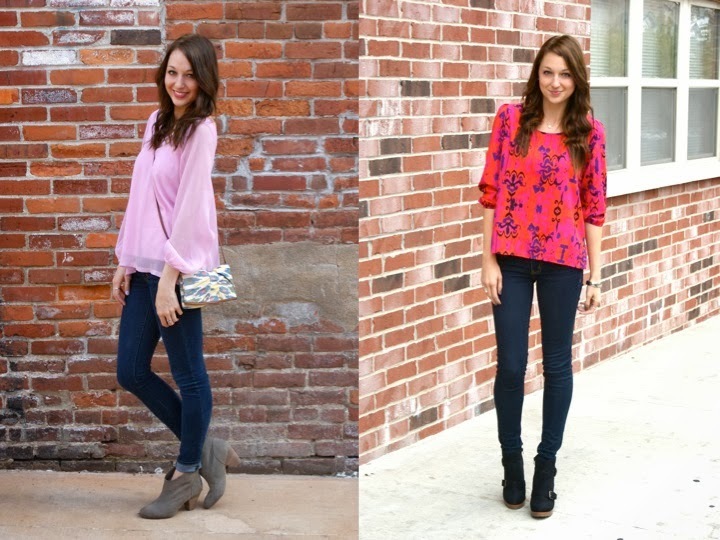 Here are some ways I've worn them, as well as some great inspiration I've found! My favorite way to wear my booties is to either cuff or roll my jeans! The outfit on the left is from this year & the one on the right is from last winter...and this year I've been preferring to cuff my skinnies just once because the look is just a little more sleek. No matter which one you prefer, I wanted to share this tip because I've found it lengthens my legs and makes them appear thinner (always a good feeling, right?)! The ankle is the thinnest part of the leg, so it helps to show a tiny bit of skin there to draw the eye down the leg. I also don't like the kankle look that can happen if your jeans bunch around your booties. In the outfit on the right (hot pink top), my booties were pretty tall so I went ahead and tucked my skinny jeans all the way in. There's a little bit of bunching here, but if you wear leggings or really fitted jeans/jeggings then it can totally work! Beyond skinny jeans, leggings, etc. I love wearing my booties with skirts and dresses! People tend to dress very casually in Missouri, so sometimes dresses and skirts can feel a bit overdone (sad, but true). So, booties are an awesome way to keep your skirt or dress feeling laid back and casual + I always love having an unexpected element to my outfit. Both of these fabulous bloggers have amazing, thin legs (so jealous), which makes it even easier to pull off the tucked in look! The style note to take away though is that both of their pants are quite fitted around the ankle, which prevents too much bunching! I love how Rachel of Pink Peonies styled her chic ankle booties with little socks! This adds extra interest and color to her look, and is so unique. Sydney of The Daybook rolled up her skinny jeans and it looks adorable. 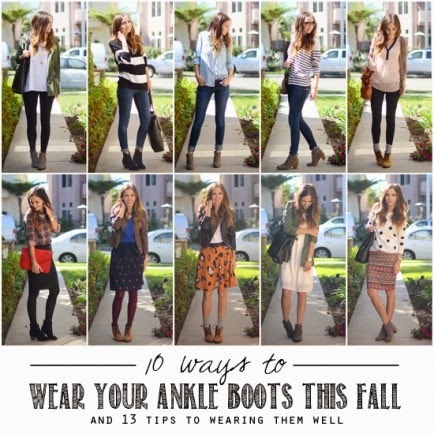 I also found this awesome guide with 10 ways to wear ankle boots! Her outfit ideas are great and she gives some really good written tips as well. 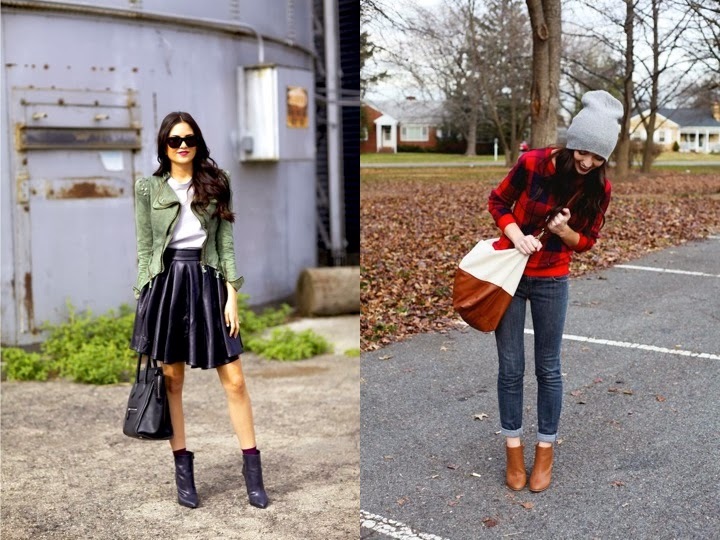 What's your favorite way to wear your booties? You really do have the best collection of booties! Loving that last leather pair. Love all the ways you styled them! So many new ideas! Such a wonderful post! Booties/ankle boots are so fun to style. I love wearing them with skinny jeans and dresses with tights. Nice post and good tips! I also don't like bunching when I'm wearing booties, I'm kind of short and I feel like it makes me look even shorter. Great tips! Definitely couldn't make it through the winter months without booties! What a perfect post!! I love the way you did different things with different types of booties - & I LOVE how the booties you wore with your skirts/dresses all dip in the front so it elongates your leg! I've been on the lookout for the perfect bootie - however, I might have to lower my standards since I have ZERO in my closet! This year since it's actually getting cool in south florida I plan on wearing my booties a lot. You styled it perfectly. 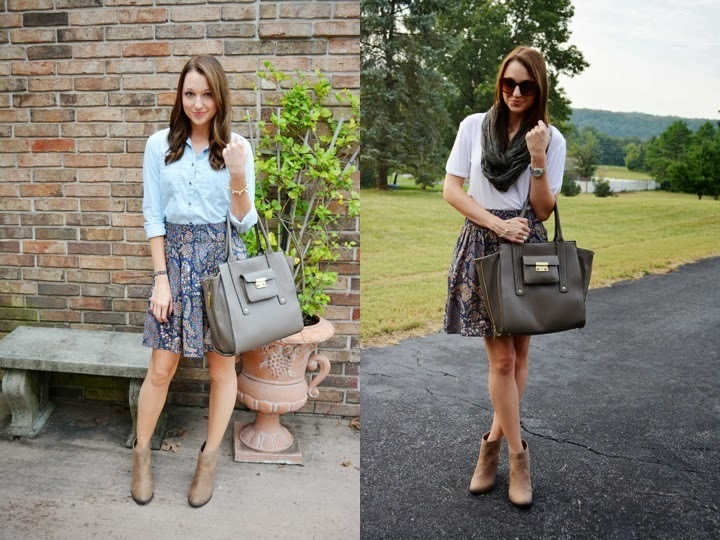 Great tips, and I love how you styled each look! It is true that booties can make a look so relaxed and I love the way you wore them. Absolutely adore this post! I love ankle booties and u think you've styled them perfectly! FYI thanks for the Barefoot Blonde link! I saw a pin of this somewhere on Pinterest ages ago but had no idea it was a blogger pic! Oh em gee thank you! Wearing ankle boots with rolled jeans that kind of "allowed" me to wear ankle boots, because when I've tried them with unrolled jeans, they totally cut me off and make me look squatter than usual! this is awesome! i love this! thanks for the great tips! i need to branch out to booties!